Side dishes | Yumtritious Eating! Tasty, nutritious side dishes add color and variety to a meal. 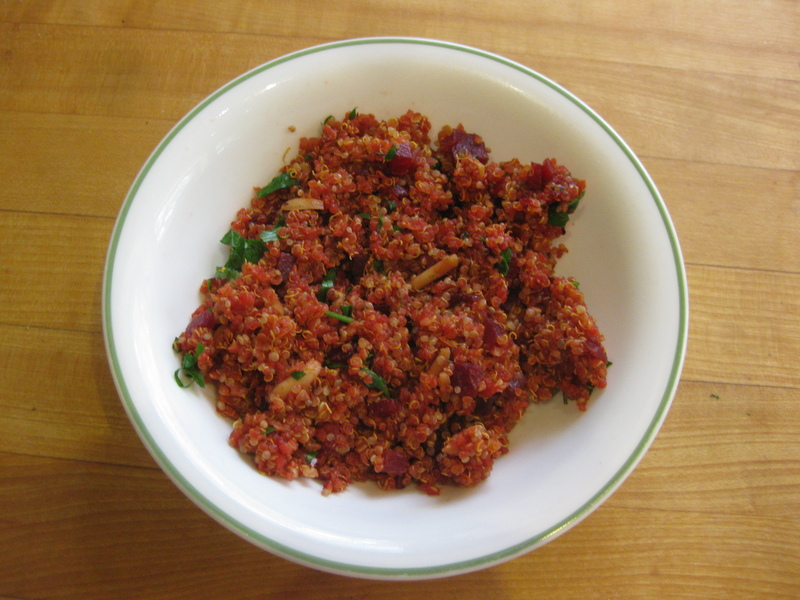 This quinoa dish has subtle flavor from pistachios and blackstrap molasses. 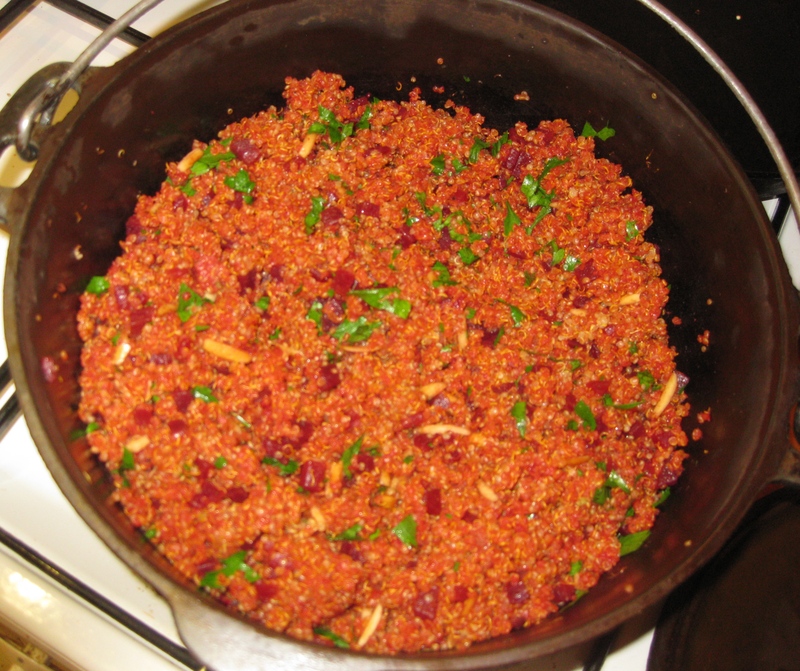 Make the quinoa: put the quinoa, water, and Tamari sauce in a small pot and bring to a boil over medium heat. When the water boils, lower the heat and cover the pot. Cook for 18 minutes. Turn off the heat and add the pistachios to the pot, but don’t mix them in. Cover the pot and keep it covered until the leaves have been cooked. 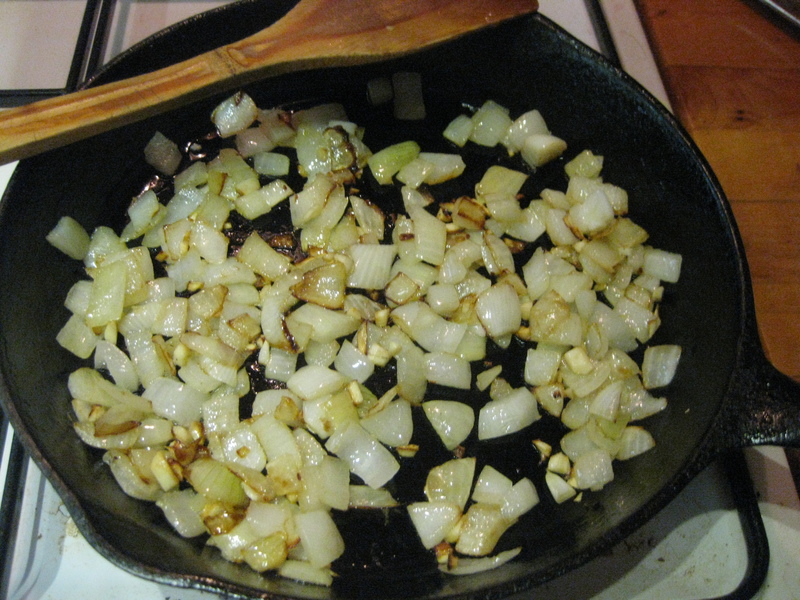 In a large pot, heat the oil over medium heat and saute the chopped onion until soft. Add the cumin seeds and blackstrap molasses and stir fairly constantly for 3 minutes. Add the chopped chard stems and stir fairly constantly for 3 minutes. Add the chopped spinach and chard leaves and stir until they have wilted. Add the paprika, salt, and pepper. Mix well, then remove the pot from the heat. 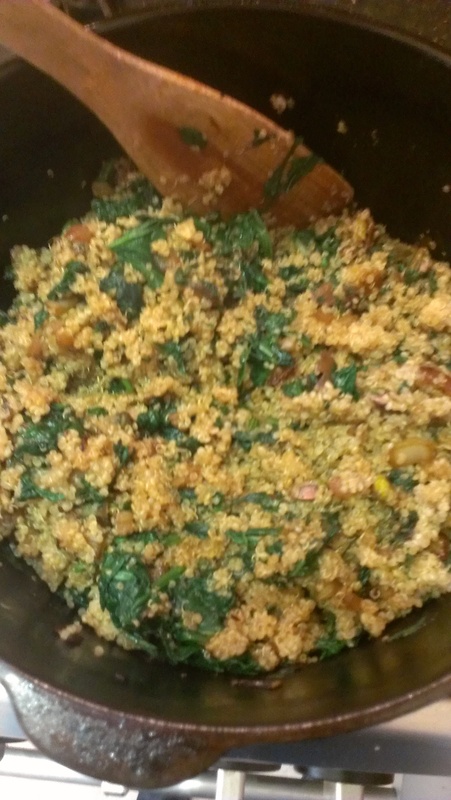 Stir in the cooked quinoa. You can add up to 3 cups more spinach or chard without it affecting the flavor of the dish. If you don’t have cumin seeds, you can use ground cumin but add it in step 4 with the chard stems. Using the pulp from juices and drinks is very important so as to minimize waste and receive the full nutritional value that foods have to offer. When soy milk is made at home, the leftover pulp, called okara, presents opportunities for okara-enriched foods. 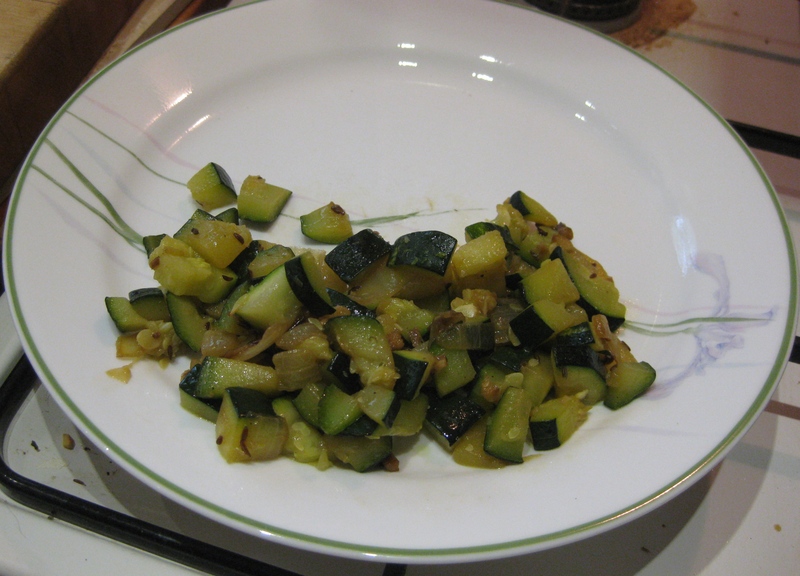 I will present several recipes using okara, starting with okara-zucchini mix. Okara is versatile and can be added to many foods. In a medium sized skillet or pot, heat the olive oil over medium heat. Saute the chopped onion until softening. 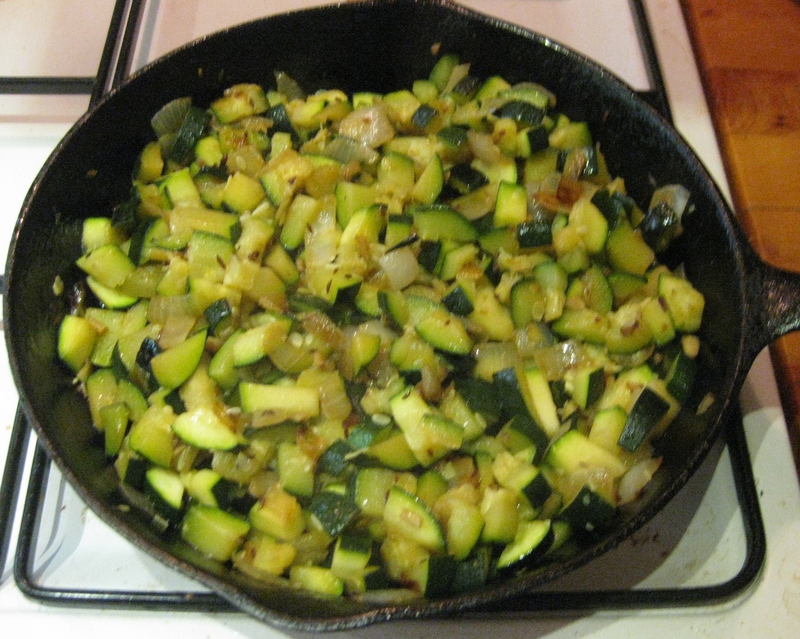 Add the zucchini and saute until the onions and zucchini are browning. Add the sesame seeds and saute for 2 minutes. Add the okara and mix it in well, then add the tamari sauce. Mix well, then remove the skillet from the heat. This dish is versatile. 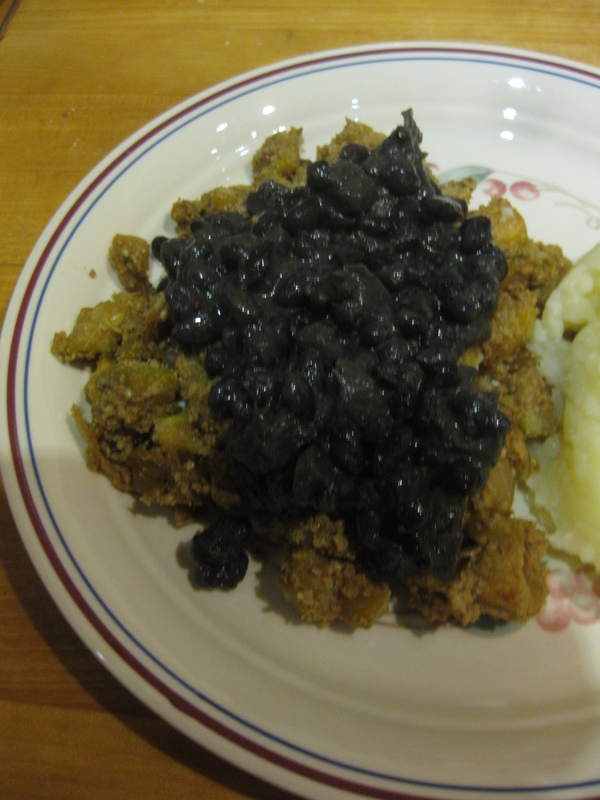 I have served it with mashed potatoes, chunky tomato sauce, and black beans. 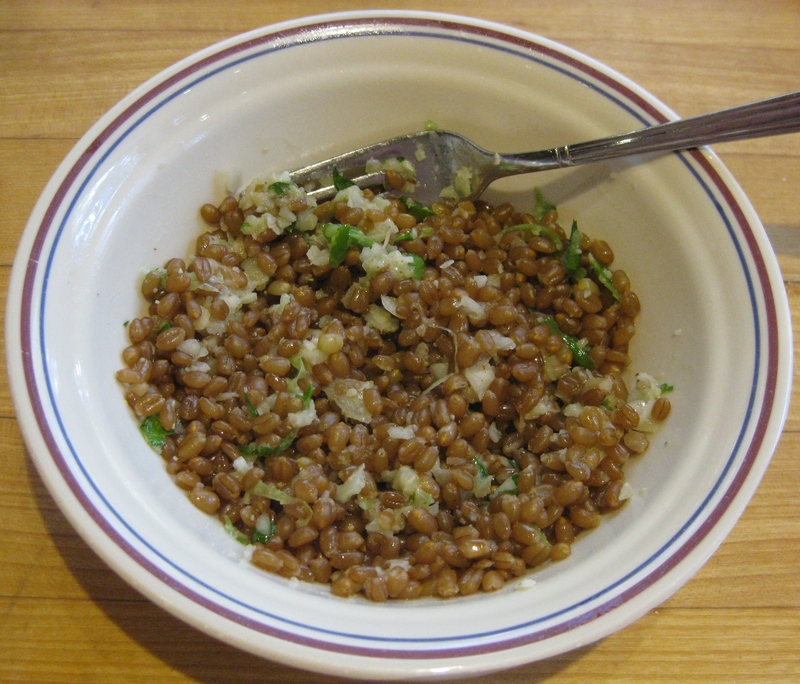 This grain topper turns plain grains into a yummier and more nutritious side dish. The topper can be used on any grain. The nutritional value of Brazil nuts, onions, and dates not only nourishes the body, but also nourishes the desire for very tasty food. In the food processor, process the Brazil nuts until they are small, but not ground. Place in a mixing bowl. Put the dates, mustard powder, salt, water and oil into the food processor and process until the dates start to stick to the sides of the processor. Add to the mixing bowl, but don’t mix. 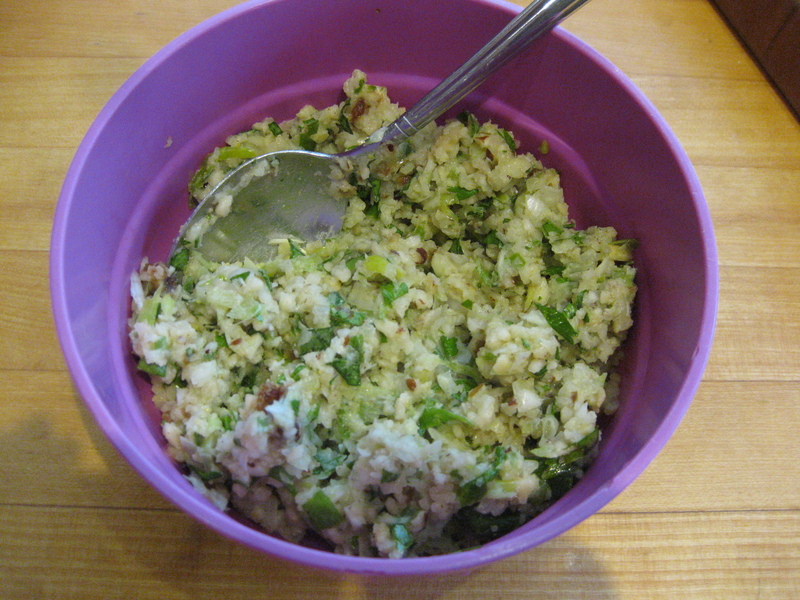 Put the onions and green onions into the food processor and process until the onions are chopped into small pieces. Add to the mixing bowl, but don’t mix. Chop the parsley by hand (for the exercise) and add to the mixing bowl. Mix the ingredients well, making sure that the date mixture is mixed in well. The topper is ready to use. The suggested ratio of topper to grain is 3 Tbsp topper to 2/3 cup grain. I stored the topper in the refrigerator and ate it the next day on toast. The onion has become sweeter over time, and the topper is really delicious! Fried zucchini is often dipped in a horseradish sauce, but that combination is not so nutritious. 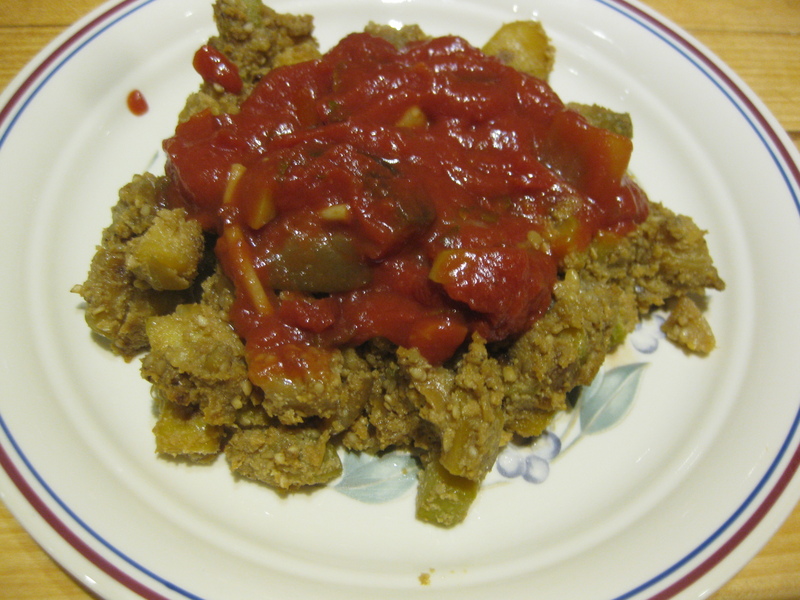 In the recipe presented here, they are paired to create a nutritious and tasty side dish. 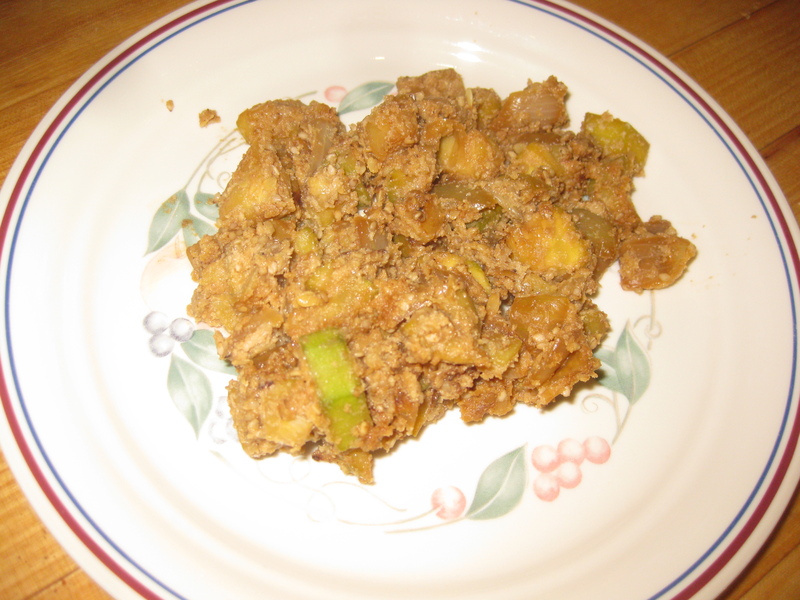 The horseradish is not a typical ingredient in a zucchini dish, hence the name “mishmash”. 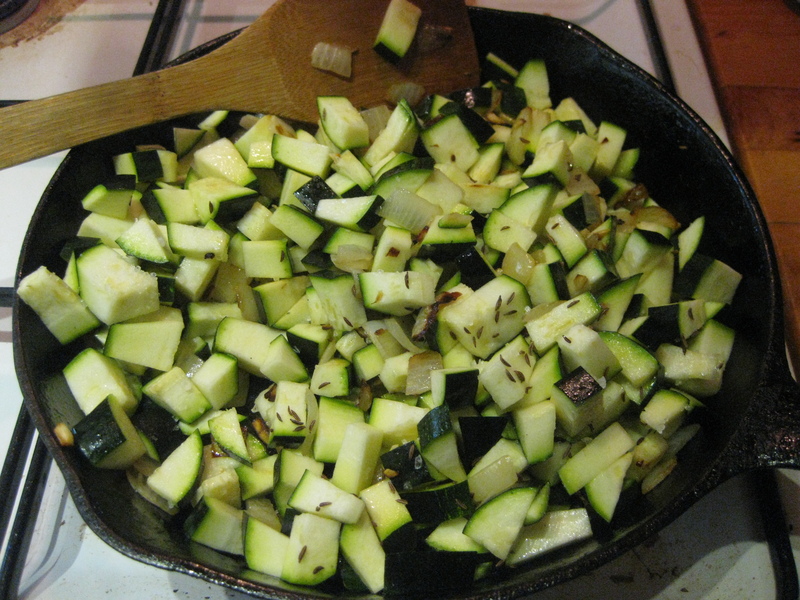 2 large zucchini, chopped (6 cups). Peel if you suspect chemical residues. 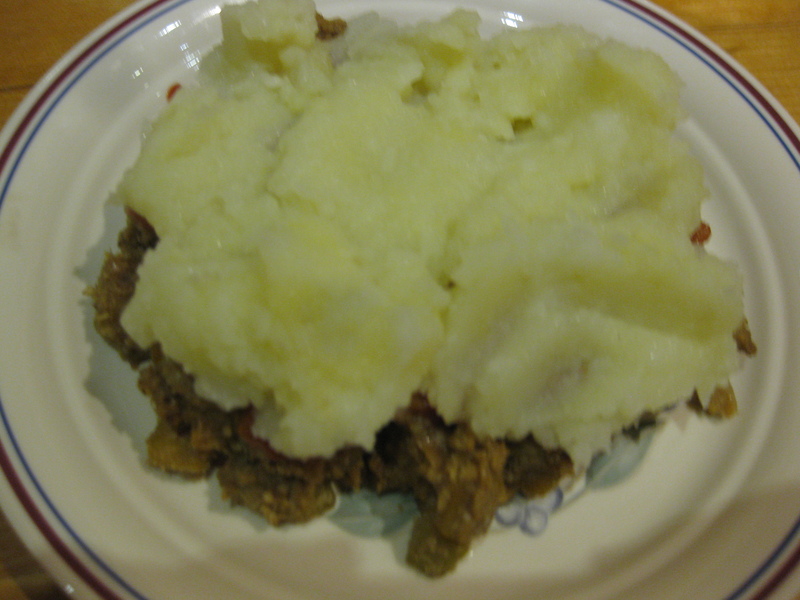 Add the chopped horseradish and saute until the onions are browning. Mix in the zucchini two cups at a time. Then add the salt and caraway seeds. Cook for 10 minutes, stirring occasionally to evenly brown.